In Spanish, Gusano Barrenador del Ganado means the worm that augers into livestock. In English, this deadly parasite is called by the less mellifluous name screwworm. But in any language, the screwworm, Cochliomyia hominivorax, has plagued humans and livestock for centuries. Fortunately, eradication efforts have been largely successful, and the United States has been screwworm free since 1982. After more than 50 years of ARS research supporting an intensive eradication program, administered by USDA's Animal and Plant Health Inspection Service (APHIS), the dream of eradicating screwworms from Central America, too, will soon be reality. A Little History As USDA's chief scientific research agency, ARS became world famous for the pioneering efforts of entomologists Edward F. Knipling and Raymond C. Bushland, who developed the sterile insect technique (SIT). SIT exposes screwworm flies to low doses of atomic radiation to make them sterile—or unable to reproduce. Flies are artificially raised and sterilized in a production plant and released by aircraft over infested areas. When sterile male flies mate with wild females, no eggs develop. SIT was first used to battle screwworm infestations of southern U.S. cattle in the early 1950s. Today, it's also used to control Mediterranean fruit flies, gypsy moths, boll weevils, and tsetse flies. In 1992, USDA developed a strategic plan to eradicate screwworms from Central America and to prevent possible reintroduction into the United States by maintaining a sterile fly release barrier at the Isthmus of Panama. "At this time, there is no conceivable reason why that goal won't be realized in 2002. In doing so, the payoff will be an environmentally acceptable solution to the problem of screwworms in Central America," says John H. Wyss, APHIS' director general of the Comisión Panamá - Estados Unidos para la Erradicación y Prevención del Gusano Barrenador del Ganado (COPEG) for the United States. José Dimas Espinosa is the Panamanian director general for COPEG. "In the last 10 years, many dedicated individuals from the United States, Mexico, and all Central American countries have pulled together to make this dream a reality," says Wyss. Costa Rica was officially declared screwworm free on October 4, 2000, after Belize and Guatemala in 1994, El Salvador in 1995, Honduras in 1996, and Nicaragua in 1999. 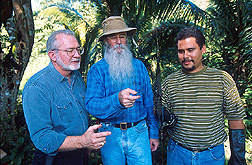 John B. Welch, entomologist and research leader for ARS screwworm research, reports that the last fertile fly in Panama's Sobernia National Park was collected in October 1999. But there are still a few cases each week being reported in Panama. For a country to be declared screwworm free, there must be no cases reported in a year, according to Wyss. trap placement in the Panama Canal area. Zoning In Panama is the ideal location for maintaining a biological barrier zone that keeps screwworm flies from reentering North and Central America from South America. About the size of the state of West Virginia, Panama is about 50 miles wide at its narrowest point. "We expect to maintain this barrier zone permanently in Panama," says Welch. 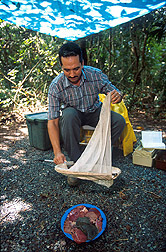 Sterile screwworm flies will be released there weekly to prevent reinfestation of Panama and Central America by native flies coming from Colombia. In Panama's Sobernia National Park, a team of six Panamanian technicians working with ARS' screwworm research unit has spent the last 5 years monitoring the behavior and movement of wild and sterile flies, and they celebrated the date when fertile flies were no longer present. The technicians, based at the Smithsonian Tropical Research Institute in Panama City, collected data on fly activity in the different vegetation types identified by satellite imagery. 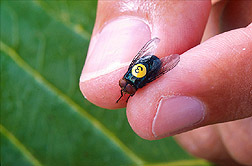 Their data is critical to updating a computer model, called Screwworm Fly Simulation, developed by ARS agricultural engineer Danel G. Haile in Panama City. The model simulates population dynamics of screwworm flies throughout the world. It uses a fixed set of biological parameters to produce realistic simulations of seasonal dynamics for locations with widely different weather patterns. "It can operate interactively on a DOS-based personal computer," says Haile. The challenge of tracking screwworms is to find their preferred habitats. But no one knew that screwworms had a preference before the groundwork was done by Welch, Haile, ARS remote sensing specialist Pamela L. Phillips, and previous ARS scientists. Their behavioral studies in Costa Rica showed that screwworm flies prefer thick, densely forested areas to open pastures. Remote sensing is the science of collecting information about Earth's surface from afar. Data can be collected from a treetop or from a plane, says Phillips. 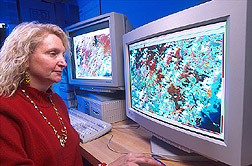 She's developing a spatial model using geographic information system techniques that will incorporate data from Haile's computer model. The two models together will allow researchers to predict how long it could take for an infestation in any part of Central America to reach the United States. Screwworm flies can travel up to 180 miles in a few days, and with warm temperatures they can complete a life cycle in 3 weeks. While Haile's model tells what elements are critical for screwworm populations, no one has clearly understood the relationships among all the elements: Is temperature more important than humidity or rainfall? Phillips predicts that the spatial model, coupled with field data and remote sensing, will help answer these types of questions. Female screwworm flies lay hundreds of eggs in any open wound on living mammals—even humans. So, although eradication primarily provides relief to the livestock industry and the economy, public health also benefits. Before Nicaragua's screwworm eradication, for example, APHIS personnel in that country reported 138 human cases of screwworms, and about 530 cases in humans occurred in El Salvador between 1990 and 1992. The larvae (or worms) feed on the surrounding flesh. "We're not sure what attracts the female flies, but we suspect that a bacterial infection emits an attractive volatile substance," says Welch. In the jungle, a single piece of rotting meat lures the flies. As they come to rest on a plate filled with beef liver, they're captured by patient technicians with butterfly nets. Data about temperature and humidity is also collected. They've learned that the area of highest fly activity is a secondary forest of trees 65 to 100 feet tall. In the Canal area, this type of forest often borders mature forests and pastures. The median recorded temperature for this vegetation type is 78 °F, which is also the optimal temperature for screwworms. Sticky traps—vertical plastic pieces covered with Swormlure-4 (developed by an ARS researcher)—are also used to attract and capture flies. (See "Shrinking Screwworm's Domain," Agricultural Research, September 1993, pp. 12–13.) "The data collected in the Panama Canal zone by the Panamanian technicians is critical to making computer and spatial models accurate in addition to documenting the extent of screwworm eradication," says Welch. 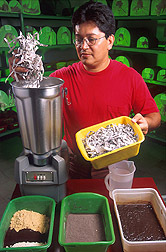 Please Pass the Spray-Dried Eggs A screwworm production plant in Tuxtla Gutierrez, Chiapas, Mexico, currently produces 150 million sterile flies per week. At one time, the facility produced as many as 500 million sterile flies a week. But as populations of wild flies decrease, fewer sterile flies are needed to cover an area, according to Donald E. Bailey, APHIS co-director of the U.S.-Mexico Commission for the Eradication of Screwworms, in Tuxtla Gutierrez. In the 1950s, the only way to produce large numbers of flies for research was to raise them on raw meat. Over the years, ARS scientists developed artificial diets, including gelled diets for rearing screwworm larvae and a honey-and-horsemeat diet for feeding screwworm flies. But the diets are costly. A horsemeat-and-honey diet costs up to $157,000 annually to produce 150 million flies per week. So APHIS asked ARS to try to cut the cost. 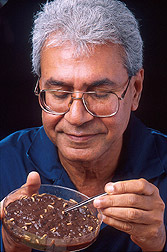 In 1999, ARS entomologist Muhammad F. Chaudhury, at the fly-production facility in Tuxtla Gutierrez, developed new diets for adults and larvae that were substantially cheaper. Chaudhury substituted spray-dried eggs for horsemeat, providing the much-needed dietary proteins at a lower cost. Horsemeat sells for $1.04 per pound; the spray-dried egg product costs 64 cents per pound. Eliminating horsemeat removes the associated high costs of transportation and refrigeration. Using molasses instead of honey in the new, meatless adult diet could further reduce costs. In research studies, Chaudhury found that female flies fed the spray-dried-egg diet lived longer and laid more eggs than those fed the horsemeat diet. Over the years, ARS scientists have made several improvements to the screwworm larval diet as well. The current larval diet is prepared from spray-dried bovine blood, milk substitute, spray-dried egg, and water mixed with a gelling agent that acts as an absorbent to solidify the diet. Blood, milk, and egg—in a 6:4:4 ratio—provide all the essential nutrients, and the gelling agent serves as an inert matrix to the growing larvae. But even more improvements could be made. Let Them Eat Paper "I began thinking about what other types of materials absorbed liquid and could provide fiber for the larval diet," says Chaudhury. That's when he and Alfredo Alvarez, biological technician with the ARS screwworm laboratory, substituted recycled newspaper for the expensive gelling agent. Not only is the paper inexpensive, it's also biodegradable—while the absorbent gel is not. To further trim expenses, ARS entomologists Steven R. Skoda and Dennis R. Berkebile in Lincoln, Nebraska, suggested replacing bovine whole blood with animal blood cells, which contain as much as 92 percent protein and provide sufficient nutrients for larval growth. The cost for an animal blood cell product is 9 cents per pound cheaper than whole blood. It requires nearly 3.4 tons of spray-dried bovine whole blood per week to produce 150 million pupae. So replacing whole blood with blood cells could result in a weekly savings of $615, according to Chaudhury. At the Midwest Livestock Insects Research Laboratory, Skoda and Berkebile also study genetic sexing techniques, which may lead to development of an all-male line of screwworm flies. "Instead of rearing 150 million flies [male and female], we could simply produce 75 million males, which would cut rearing costs in half," says Skoda. As extensions of the screwworm research team, Skoda and Berkebile also stand ready to assist whenever there's an outbreak anywhere in Central America. Reaping Rewards of Research A half-century ago, the sterile insect technique began with the vision of two ARS individuals. Now a paradigm for insect control, SIT has transformed insect-control strategies from depending almost entirely on chemicals to curbing pest populations by naturally disrupting their reproduction. For livestock producers, the payoff for this research is in reduced production losses and lower veterinary and labor costs for treating animals with screwworm-infested wounds. These savings can be passed on to consumers through a decrease in the cost of meat, dairy products, and leather goods. Just as important, the technology eliminates use of insecticides. This alone helps to protect our global environment, lessen direct exposure of humans and other nontarget organisms, and preserve the genetic diversity of wildlife. The U.S. livestock industry could suffer $900 million in production losses annually if this pest were reintroduced. Limited screwworm outbreaks in Mexico, along the U.S.-Mexico border, and in Florida were contained and eradicated. Screwworm eradication efforts are also ongoing in Jamaica. It may take 6 or 7 years for similar efforts in the Caribbean to be completed.—By Linda McGraw, Agricultural Research Service Information Staff. This research is part of Food Animal Production (#101) and Animal Health (#103), two ARS National Programs described on the World Wide Web at http://www.nps.ars.usda.gov. To reach scientists mentioned in this article, contact Linda McGraw, USDA-ARS Information Staff, 1815 N. University St., Peoria, IL 61604; phone (309) 681-6530, fax (309) 681-6690. "Squeezing Out Screwworm" was published in the April 2001 issue of Agricultural Research magazine.